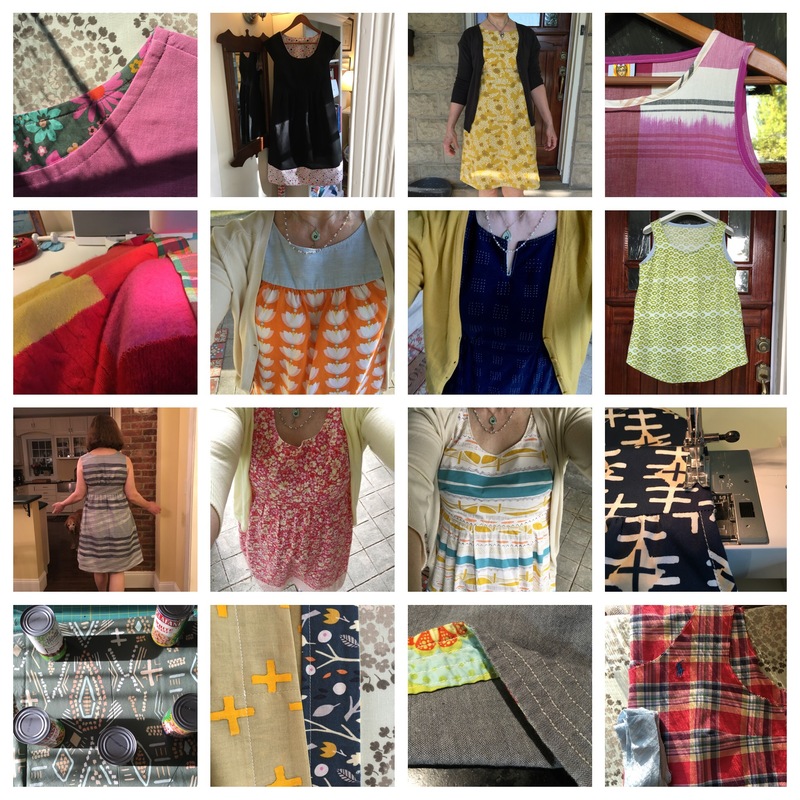 A little more than two years ago, I started sewing my own clothes and last fall, I took the plunge into knits. I lived all winter long in my Isla Capsule Wardrobe and this summer, I decided to sew some more versions in some floral fabrics in a slightly longer length in light of bare legs vs leggings. I had picked out a beautiful purple floral by Pat Bravo, the beautiful green floral from Rae Hoekstra’s Sidewalk Fabric line and the blue-green colorway of Amy Butler’s Glow knit which I scooped up when it was on sale, having been really happy with the fabric when I sewed the grey colorway as one of my first Isla tops. And as worn here: This would seem to be plenty: 3 summer dresses. And then, April Rhodes’ amazing new fabric line was released and I was inspired to make one more. I alternate my sewing methods. Sometimes I sew my clothes in batches of the same pattern in different versions. This was one of those times, especially since I switch not only the needle and thread type when sewing knits but also the sewing machine foot (I always use a walking foot). Other than adding an inch to the length of the skirt (which I neglected to do for the Glow version, I am not sure why) I followed exactly the same methods I used for my first batch of Isla’s which was to use all the tricks that my Instagram friends shared with me and which can be found in this post, This is the first time I have sewn contrasting neck and arm binding and I am really happy with this combination. And as worn: Next up I made the Sidewalk fabric version. I knew it would be good because I had seen Rae’s version which inspired me. This fabric is really nice to work with and I am so happy with how this version turned out. And as worn: Next I sewed the Indie Boheme version. This fabric feels very summery to me. I almost bought it in voile to make Rae’s Josephine blouse with gathers. That pattern has been on my To-Be-Sewn list for quite some time and I love her new Loominous II version. And as worn: The Amy Butler version is a bit shorter which came in handy when we recently had a heatwave. I didn’t think I cut it differently but I must have. This fabric is a bit heavier than the others. It is really easy to sew with and would be great for someone new to knits. And that would have been it, except that Erin made two beautiful maxi versions of the Isla and I saw another version of a knit maxi dress on Instagram that was not the Isla but which used a blue and white shibori-inspired print. That is when it clicked for me and I decided to take the plunge. I found this bamboo-rayon knit and ordered it on a Monday. It arrived on a Friday. I literally got home from work, washed the fabric, cut the fabric, sewed the fabric. I added about 20 inches to the length of the skirt. I added about 6 inches to the width of the back skirt and none to the front. The fabric was a bit slippery and a bit tricky to cut. I was in a bit of a panic for a minute because I had some trouble lining it up correctly to cut the skirt pieces out after having cut out the bodice but it all worked out in the end. I wore it to a family wedding that next day and I plan to wear it until I wear it out. It is amazingly comfortable, flattering and doesn’t wrinkle. Perfect for a trip to someplace amazing. Now all I need are airplane tickets. Mr. NB, take note! And it is even better with my mustard cardigan, as most of my dresses are. One of my favorite winter Islas did get some wear time this summer on one of our cooler days. Here it is with leggings and sneakers. I can’t recommend this pattern more highly! Love the long dress but all the fabrics are beautiful. Thank you! I had fun choosing the fabrics!